The past few years have been hard on our public libraries – and on everyone. In 2009, the Hawaii State Public Library System (HSPLS) faced budget cuts of more than 20%, leading to furloughs and fewer hours. Thanks to the Keep Your Library Open and Keep the Doors Open campaigns, which has raised over $300,000 as of August 2010, we’ve been able to keep libraries open and staffed. Despite technology and ebooks, we still need libraries – and real books, ones with weight and texture and yes, sometimes a musty smell. I even kind of miss the old sign-out cards, which let you see all the people who borrowed the book before you. So here’s a great way that we could help out our public libraries and share the books that interest or inspire us, while honoring our family, friends, and the people important to us. The Hawaii State Public Library System could create a website where librarians can list the books that they would like for their library but don’t have the money to buy. They might want new books, out-of-print books, or books that have been lost or damaged. Anyone could view their online “wish-list” and choose books that they think other people would enjoy. 4. Choose the inscription label that you would like to place in the donated book. There could be four choices: Donated by…, In Honor of…, In Memory of…, or Anonymous – just like donations to the Hawaiian Humane Society. I don’t know how much it would cost to integrate the wish-list with the existing online reservation system by adding a “Donate book” button (there are currently two options: “Add to my list” and “Request Item”). But I think it’s worth thinking about. People could have more book choices, and book donors could get a little recognition too – for the cost of a 10¢ label. Sir Richard Steele wrote, “Reading is to the mind what exercise is to the body.” I encourage everyone to read a little every day – and support our public libraries. Growing up, my family didn’t really talk about money, budgets, bills, or charity. My grandfather earned money; he (and the rest of my family) mostly left generosity to my grandmother, who contributed to her church, missions, and evangelical ministers, and spent time helping churchmembers. I never thought about planning for generosity until I read “The Generosity Plan: Sharing Your Time, Treasure, and Talent to Shape the World” (2009) by Kathy LeMay. But think about it – we plan for vacations, weddings, college, and retirement; we save generosity for when we have “enough” money or when we pass away. Why not have a plan for giving back while we are alive? Generosity is not about giving large amounts of money, or even how large your estate is when you die. Generosity is about “finding your passion, envisioning a better world, and putting yourself on the path to making that vision a reality” (page x). LeMay advises us to keep a Generosity Journal, which will help you create your Generosity Plan. Her book is filled with personal stories about ordinary people who made a conscious decision to give back. There are questions, exercises, and tips to help you practice philanthropy in your life. I won’t go into the full detail of LeMay’s Generosity Plan here (if you’re interested, read her book or visit her website at http://www.thegenerosityplan.com), but I want to highlight the five steps that resonated with me. 1. Look back at your giving roots. “Each of us has roots in giving, be they based in culture, faith, personal belief systems, or family” (page 1). Think about how your family, friends, and teachers gave back. List the people that inspire you and how they changed your life. Reconnect with the things that you did which were most fulfilling. 2. Unlock your vision and set your priorities. “With a vivid and powerful description of the change you want to see, you put yourself on track toward transforming an idea into a reality” (page 18). Determine the causes and issues that you are most passionate about, and decide how you would change the world. It’s important to stand for something, not against something! 3. Share your time, treasure, and talents. “The time, treasure, and talent model works because it takes all of our gifts in service to the greater good” (page 42). Choose organizations that match your passions, goals, and values. Give your time informally (such as helping family, friends, and neighbors) and formally (such as becoming a mentor or tutor). 4. Create a giving formula. “You will feel powerful when you add a generosity line item to your life budget” (page 131). Figure out the percent of your income (not the dollar amount) that you currently give to charity, and what you would like to give. Determine what percentage would feel empowering to you, and what is truly affordable. 5. Know what successful giving looks like. “The five keys to a successful Generosity Plan are: vision, boldness, authenticity, staying the course, and support” (page 225). If you know what to expect from your giving, you can feel a sense of accomplishment or progress. Decide whether you need immediate results (such as feeding the hungry) or long-term social change (such as ending hunger), or both. “Philanthropy belongs to all of us because the world needs all of us to participate” (page xxii), LeMay declares. What does generosity mean to you? There are four correctional centers and four prisons in Hawaii. I’ve never visited a prison, so I don’t know anything about the living conditions. But I do know that we have over 1,800 inmates living out-of-state, and there must be a way that we can house them in Hawaii, close to family and friends. Yes, prison is a punishment; but we’re also punishing their families and making them feel even more isolated. I don’t advocate building more prisons – we don’t have the money for it, and it doesn’t help prevent crime. We need to do more with the prisons we already have. How can we run more efficient prisons that also help strengthen the inmates’ ties to the community? * Run no-frills prisons. Basic meals: cereal and toast for breakfast, sandwiches for lunch, and one hot meal for dinner. No cable TV, no gyms, no recreation facilities; no Internet access. If we run out of beds, use tents. Hikers, campers, and mountaineers live in tents without complaint. How about flowery or Spongebob Squarepants uniforms and pink underwear for men? It works for Sheriff Joe Arpaio in Maricopa, Arizona. It could work here. * Grow more prison gardens. Let’s help prisoners grow more of their own food and beautify the prison grounds too. Since 2004, the Women’s Community Correctional Center in Kailua has had a lei garden and taro lo‘i, thanks to a grant from the Garden Club of America; and since 2008, they have had a hydroponic (soil-free) garden for lettuce and tomatoes, with the help of the Lani-Kailua Outdoor Circle. Wahiawa Correctional Facility also has a horticulture program which produces vegetables for inmates. Is there an update about these garden programs? Why can’t we expand garden programs to more prisons? * Start a “night inmate” program. In addition to “work release” programs for non-violent first-time offenders, consider a “night prison” program so that inmates can go to work during the day (or night) and spend time with family, but must spend at least 12 hours in prison (or a secure facility). They would be allowed at the job site (unless their supervisor sends them off-site with written permission), their home, an approved relative’s home, or in transit; any other visits must be approved in advance by a corrections officer. The benefits: inmates are still connected to their family and the community; they could hold a job; and they could pay for their incarceration and/or restitution. Obviously, the idea needs a lot of study, and I don’t know if it could work. But it’s something to think about. These ideas won’t deter crime, but they could help us save money, so that we can run more efficient prisons, Hawaii inmates can stay in Hawaii, and we can strengthen community ties. What do you think? Education is an interesting phenomenon. Parents buy a good education for their children and teachers are paid to teach. But while children receive an education, they don’t really have much say in the education they receive. Right now, students are “motivated” by good grades, good report cards, and eventually a diploma. All of this is in preparation for what most students want – a job or college admission. But wait… It may be what they need, but it’s not necessarily something that students want. It doesn’t motivate them to do well. Some schools reward students for their efforts, whether it’s ice cream socials, prizes, awards, or scholarships. It’s fun, but it doesn’t have a lot of meaning in their daily lives, and it mainly motivates the students that are already working hard in school. * Bring back show and tell. Schools can start a “Hobby Week” in which students can present or demonstrate their favorite hobbies, sports, and inspirations; or allow time for Club expos. How about student fashion shows or art exhibits? It’s a great way to let kids share the things that really interest them, and they’ll probably work hard at it. * Give kids more choice in their studies. For one week during the semester, teachers could let students vote on a topic to study it. The class could come up with their own lesson plans, created by teams of students, and help to arrange field trips, experiments, or special speakers. * Let kids help write their own tests. Students could submit questions and answers for weekly or final exams; if their question is selected, they might receive extra credit. Teachers could even challenge students to come up with difficult (but answerable) questions, motivating students to study and think. And it’s not just in the classroom. Parents can turn anything into (don’t tell) an educational experience. When kids ask, “Why?” don’t be too quick to answer – ask them what they think. At home, talk about TV or Internet shows – do you think it could really happen? do you agree with what a character did? what would you do? At restaurants, talk about different ingredients and cultures. On vacations, challenge each other to history and trivia facts. What made you enthusiastic about school, or what turned you off? Who were your favorite teachers and how did they motivate you? How can we motivate students today? I wasn’t in Hawaii when the Kamehameha Schools and Bishop Estate “Broken Trust” controversy erupted. I thought it was about the arrogance and irresponsible spending of the trustees. I didn’t realize how the trustees’ actions hurt everyone, and created an environment of frustration, mistrust, and fear. 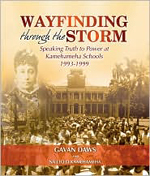 That is, until I read “Wayfinding through the Storm: Speaking Truth to Power at Kamehameha Schools 1993-1999” (2009) edited by Gavan Daws and Na Leo O Kamehameha. It is a powerful compilation of over 150 voices of Kamehameha Schools Bishop Estate faculty, staff, students, alumni, and others, based on interviews conducted by David Kawika Eyre. The book is intended to help us remember what happened; reinforce the bonds of the Hawaiian community; and remind us that wayfinding is about building relationships, not just achieving a goal. After an overview of events leading up to the “Broken Trust” and the march on Kawaiaha‘o Plaza, the book is ordered chronologically into 23 sections. There are photos and cartoons, but no further narrative; each voice speaks for itself. “We were told that this is the way it’s going to be, and that the bottom line is there will be no discussion,” states Hawaiian language teacher Ekela Kaniaupio-Crozier (page 132). Performing arts teacher and department head Randie Fong says, “I would give up my job at Kamehameha so that there wouldn’t be any game playing. This is a very serious thing, and it’s hurting our school,” (page 156). “If we failed to stand up at that time, then all we stood for in front of our kids failed with us,” Hawaiian language teacher Kawika Eyre states (page 200). Their words reveal experiences straight out of a suspense novel, with secret meetings, closed boardrooms, intimidation, snitches, last-minute contracts, hit lists, lie detectors, and phone taps. Their sincerity and passion are a sharp contrast to trustee Lokelani Lindsay, who asserts, “I still don’t feel I have done anything wrong” (page 283). I was moved to see familiar names: my high school classmate Hailama Farden, now a Hawaiian language teacher; Gail Fujimoto, the librarian who sponsored our high school Literary Society; our Song Contest advisor Randie Fong; and even Kahu David Kaupu. “Wayfinding through the Storm” is emotional, personal, and honest. More than any article or essay, the words of those personally affected by the “Broken Trust” are a testament to their focus on students and conviction to do the right thing. 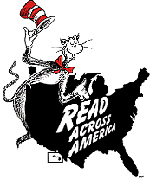 March 2 is Read Across America Day – and Dr. Seuss’s birthday! Let’s all celebrate by reading to a child! Did you know that just 15 minutes a day of independent reading (out loud with parents or by themselves) can expose children to over a million words every year? (Anderson, Wilson, & Fielding, 1988). Children who read at home have larger vocabularies, greater success in school, and good reading habits that can last a lifetime. Since we’re celebrating books and the joys of reading, I thought I’d share some of the Hawaii activities and programs that encourage a life-long love of reading. Hawaii Public Libraries (http://librarieshawaii.org) offer free ongoing storytimes for children ages 3 and up, as well as cozy reading areas and other special events. Bookstores Barnes & Noble (www.barnesandnoble.com) and Borders (www.borders.com) offer free ongoing storytimes and special events, as well as author signings. Read to Me International (http://readtomeintl.org) shares the love and joy of reading aloud. Their message is simple: “Every child in Hawaii will be read to every day for ten minutes.” This year, you can listen to them at the free Kahala Mall Toddler Times on February 16, April 16, July 6, and September 7. Schools and community events with at least 50 participants can also request a presentation. Book It! Reading Program by Pizza Hut (http://www.bookitprogram.com) helps K-6 teachers encourage reading by setting monthly reading goals. Children can earn Pizza Award Certificates and qualify for the All-Star Reader’s Honor Roll. Ask your school to sign up for this free program! Read Aloud America (http://readaloudamerica.org) promotes literacy and encourages a love of reading. Schools can pay for a classroom program and 6-session family program. Hawaii Literacy (http://hawaiiliteracy.org) promotes literacy and lifelong learning. Volunteers offer adult literacy, family literacy, classroom on wheels, English as a second language, and a drop-in center. Reading is Fundamental (www.rif.org) motivates young children to read. They have a network of volunteers and literacy programs in Hawaii public schools. First Book (www.firstbook.org) provides new books to children in need. Schools and programs with at least 50% of their children from low-income families can register to buy books at a 50-90% discount. Some schools may even qualify to receive new books for free. Dr. Seuss wrote, “The more that you read, the more things you will know. The more that you learn, the more places you’ll go.” Where can a book take you today? What books have inspired you? And who will you inspire by reading today? You are currently browsing the Better Hawaii weblog archives for March 2011.